Breeders of the #1 Toy Manchesters in both Canada and in the U.S.
We are particularly looking forward to 2009 as it marks our 25th year in Toy Manchesters. It is hard to believe that 25 years have passed since Billy came into our lives -- who would have thought that skinny, gangly puppy would have started all of this. We have been truly blessed to have shared our lives with so many special dogs (and their people!) through the years. Brita ended her show career in September on a high note with Best of Breed at the 2008 Canadian National. The day after she jetted home with us in anticipation of a long-awaited first litter. Despite ending the season four months early, Brita (then ranked #5 Toy in Canada) had amassed enough points to keep her in the Top 10 Toys through to the end of the year. Finally feeling cooperative, Brita has given us an early holiday gift and FINALLY came into season. 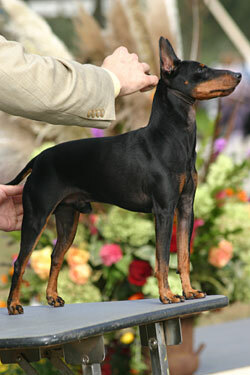 She will be bred to MBIS, MBISS Can/Am Ch Salutaire That's My Man. Miss Macy had a great year, beginning with Amanda and joining Joy in BC in September. During 2008 she earned many wins on both coasts, including more than 30 group placements (including 12 Group 1sts) and a Reserve Best In Show. We are looking forward to exciting things from Joy and Macy in 2009! Jake earned his fourth US National win in May, owner-handled from the Veterans class. Ever the showman, it was obvious he hadn't forgotten a thing! Indy is enjoying the good life, that's for sure. 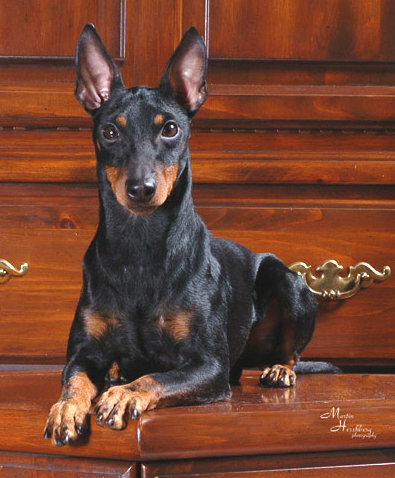 He made only two appearances in the show ring this year, one to earn his CFC title and the other to travel to New York where he snagged Best of Breed at the Progressive Toy Dog Club show. He trained hard through the summer with Cindy and Felicia McKeen, earning a leg towards his jumpers and weaves title. Now, if only there were more CKC trials in our area! Indy will continue to work with Cindy this winter (in between napping on our couch). It's a hard life... but somebody has to do it. Marilyn doesn't go to shows too often anymore, but did make an appearance at the 2008 World Show in Sweden. Additionally, her puppies have begun hitting the show scene in Norway and are doing very well!